Place: At my main computer, enjoying the very quiet morning. Most days at this time would be dominated by cars warming up and little dogs yipping at one another. Reading: This morning I finished Donna Tartt’s The Secret History. It was a long, diffuse, but quite fascinating story of a group of college students that, under the influence of their classical studies, wind up committing a couple of murders and endeavor to keep them secret. Both the characters and story were really compelling, especially appealing for the more bookish among us. Now I’m anxious to move on to Tartt’s most recent book, The Goldfinch. I’m also close to the end of Martha Beck’s Finding Your Own North Star: Claiming the Life You Were Meant to Live, which has so far helped me considerably in identifying the problem areas in my life, even though the solutions haven’t become evident yet. I am now at that wonderful stage when I can decide what I’d like to read next. I don’t know if it will be fiction or non-fiction, art history or biography or novel. As I’m fairly sure I already own more books than I will ever be able to read in this lifetime, at least I’ll have a range of choices! Viewing: Two Criterion Blu-rays were the extent of my movie watching this week. Autumn Sonata, oddly enough, I had never seen before. A typically claustrophobic Ingmar Bergman drama, it was just the thing for me at the time. Ingrid Bergman, in the only time she worked with her namesake Ingmar, apparently came into this production overly prepared and spent the first couple of days of shooting overacting terribly. But Ingmar intervened, and now the exchanges between Ingrid and Liv Ullmann (who remains for me one of the most fascinating-looking women ever in film) are pretty mesmerizing. Also viewed was another much-praised film I had somehow missed the first time around, Wes Anderson’s The Royal Tenenbaums, which managed to combine rather dark, personal subject matter, a whimsical storytelling style, and vibrant visuals in an entirely wonderful way. Amazingly, this is the first Wes Anderson film I’ve ever seen. Now I must seek out more. Listening: Not much in the way of music listening this week, other than a few odds and ends on YouTube. Blogging: Yesterday I posted the final installment of my southeast Asia travel journal, documenting my trip this past February through Thailand, Laos, Cambodia and Vietnam. This project also provided me the excuse to go through the hundreds of photos I took, many dozens of which appear in the journal entries. The journal has its own tab at the top of my website now, so access to it is quick and easy. Now that the journal, which dominated several weeks of my blogging, is done, I have to figure out what to do next. Pondering: A week ago today I broke up with my girlfriend of several weeks, or rather she broke up with me. Little else has entered my pondering recently. Instead of this Salon you’re reading now, I had originally written a long, extremely personal piece about the woman, the relationship, and the breakup. But after seeking out some friends for advice, making that essay public came to seem like a bad idea. So I will keep it to myself, for now at least. While I never actually got a chance to talk with her about what happened, my best guess is that I was looking for a passionate romantic relationship, and she was looking for someone nice to go places and do things with. We were on different life courses. I might have been able to moderate my emotions to be more in sync with her needs, but then I wouldn’t have been true to myself, would I? Nevertheless, I’m still filled with regrets and longing. Anticipating: Another trip to San Francisco for some art, music, and baseball may be in the offing. Otherwise, though, my thinking has been too dark to do much anticipating of anything. Gratuitous Rainer Maria Rilke Quote of the Week: As I was in the midst of my emotional tumult of the last couple of weeks, looking through a Rainer Maria Rilke anthology provided me great solace. More than once in my life have I had the experience of opening a Rilke book, sometimes quite at random, and finding a quotation that seems directly relevant to me and my life. The following one was my big discovery for the week. My Facebook friends have already seen this. Perhaps it will hold some meaning for you too. After this morning’s writing I caught a tuk-tuk and went to the Angkor National Museum, which provides a very nice summary of Cambodia’s ancient history. Their presentation started with a short summary film and the Gallery of 1,000 Buddhas, a collection of Buddha images in stone, wood, and precious metals from throughout Khmer history. They were arranged by posture, time period, and material. While the many small images arrayed along the walls weren’t really accessible or visible, the larger ones were in full view. A fine, meditative space. 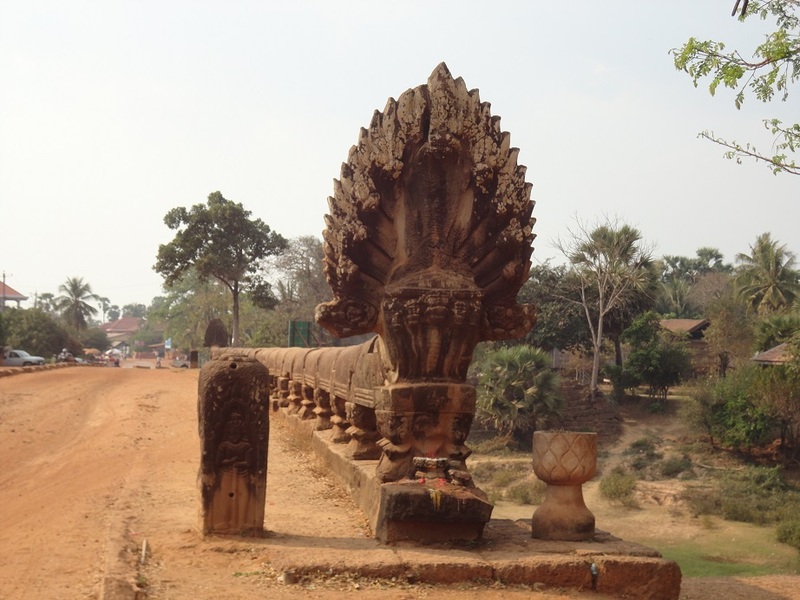 The remaining galleries traced Cambodia’s history, from its pre-Angkorian history in Funan, through the different belief systems – Hindu, Buddhist, and to a lesser extent folk religion. 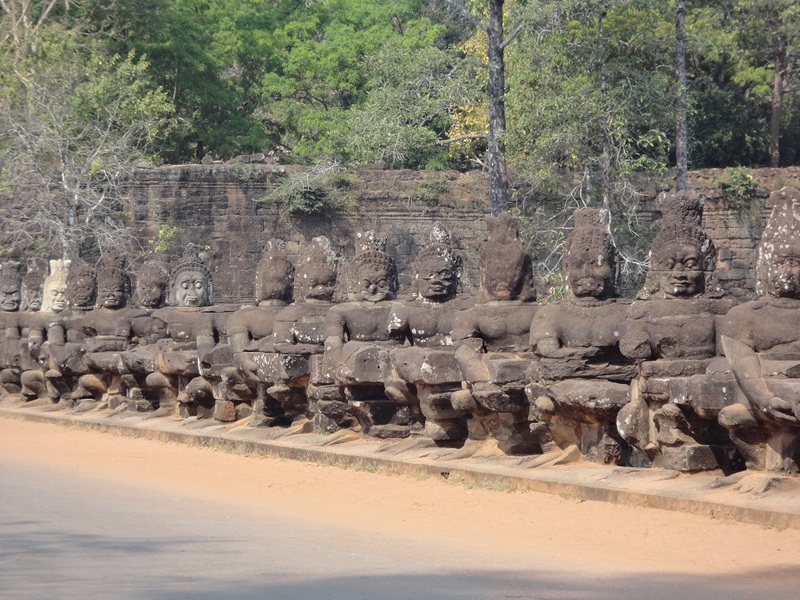 Then the major Khmer kings like Suryavarman II and Jayavarman VII were profiled and their works listed. 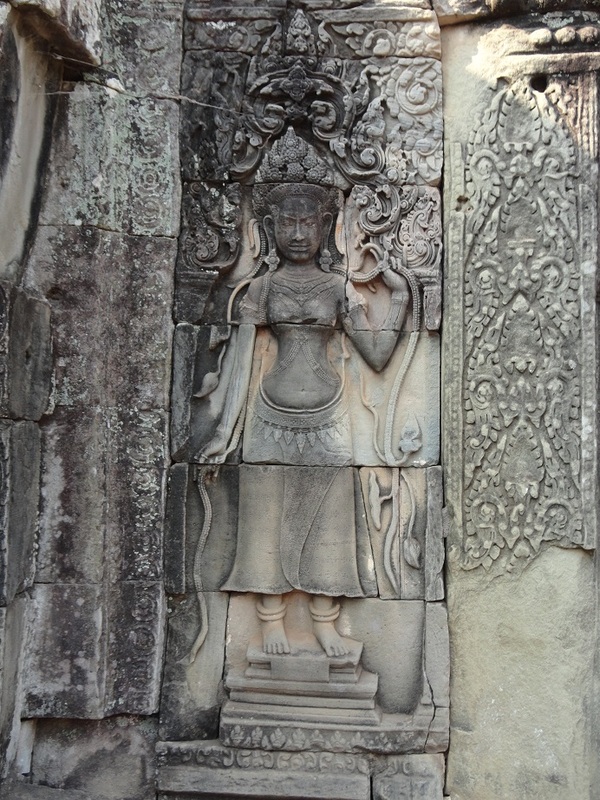 Two galleries were devoted to Angkor Wat and Angkor Thom; the latter was actually the more extensive. Stelae detailing Khmer history and language were followed by the concluding gallery dedicated to clothing styles as revealed in ancient Khmer sculpture, and a final section on apsaras, which I didn’t realize had so captured the imaginations of both Cambodians and tourists. Pretty females doing sensuous dances will do that. I barely looked at the sometimes extensive texts provided with the individual images, relying on the larger summary texts and the very good audio guide (featuring a voice I’m certain I’ve heard in other museum audio guides). Then it was back to the hotel for the bus, a flight from Siem Reap to Bangkok – and now I am back in the hotel that started all this. My plan is to set this journal aside for tomorrow, then return to it back home for some final thoughts. Dinner on the river ensues in an hour. On the morning that I’m finally getting back to my daily routine of walking, meditating, writing, and so on, it seems appropriate to return finally to this journal to wrap up the final, painful day-plus of my trip. I should start by mentioning that when I returned to Bangkok, my hotel room was in fact larger than my home. Two bedrooms, three baths, three televisions, and much walking space, all just for me. 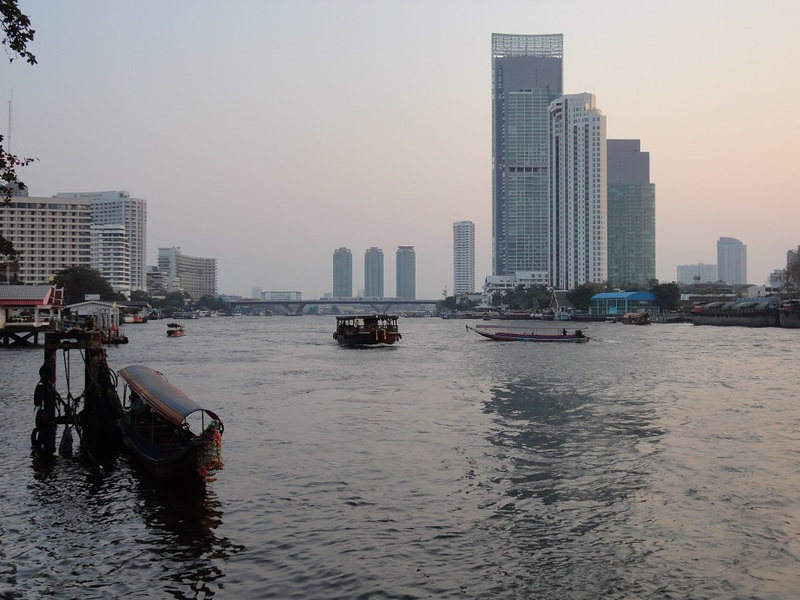 The farewell dinner cruise on the Chao Phraya River in Bangkok was quite nice. Once again there were plenty of vegetarian options for me. Along the river were all manner of noteworthy sights – other ships large and small (many tourist-oriented), large hotels, brightly lit stupas and temples, a very attractive modern bridge spanning the river, and amidst it all a few stretches of older, in some cases decrepit, buildings that hinted at what the river might have looked like in times past. 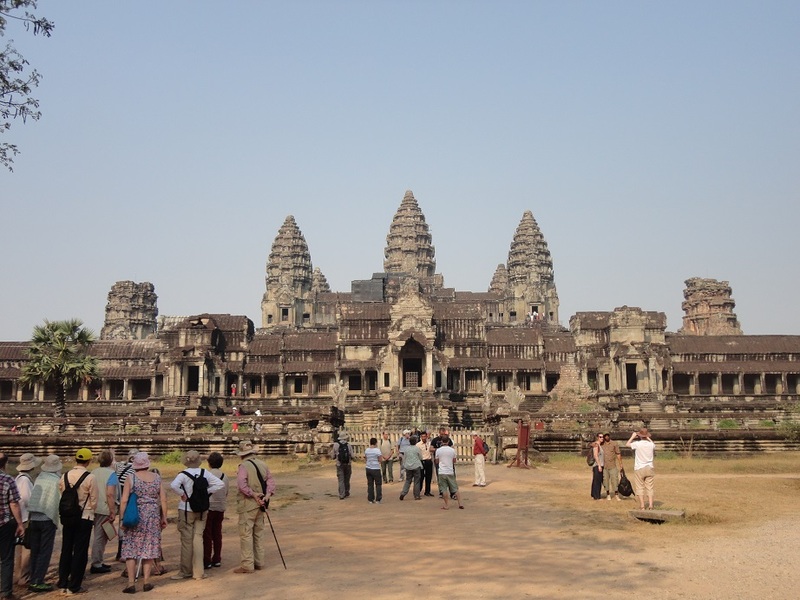 In around half an hour I will be heading out to the Angkor National Museum for a visit. Before that, however, I want to recount the events of yesterday afternoon. 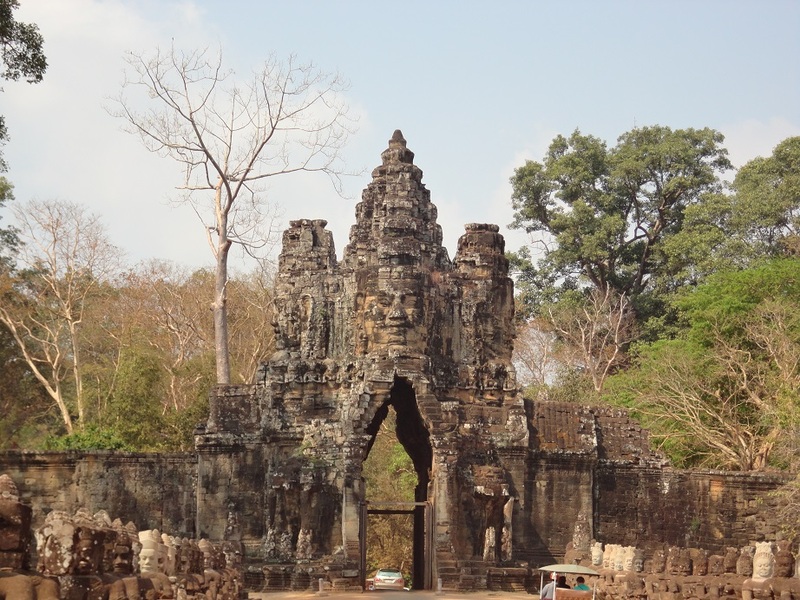 We started at one of the gates of Angkor Thom, the great (3 km by 3 km) city of King Jayavarman VII. 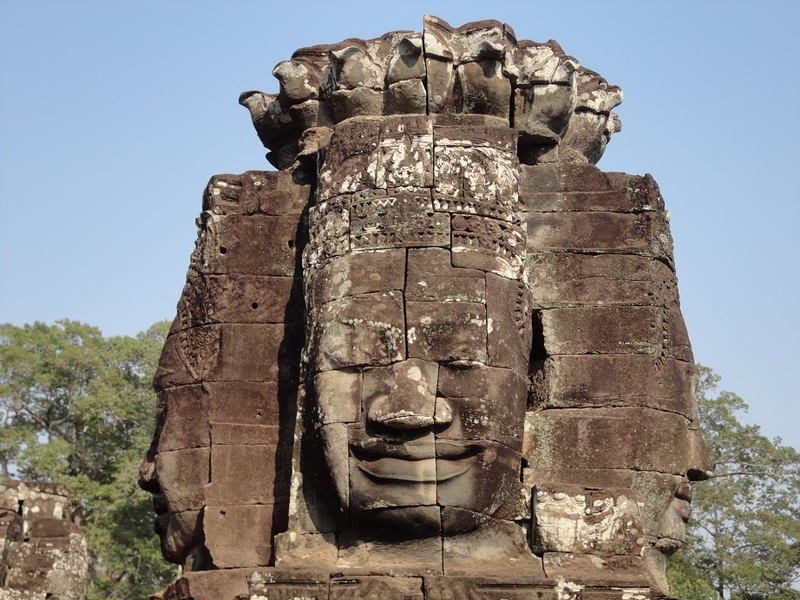 At the center of Angkor Thom is the Bayon, the state temple for Jayavarman’s Mahayana Buddhist faith. 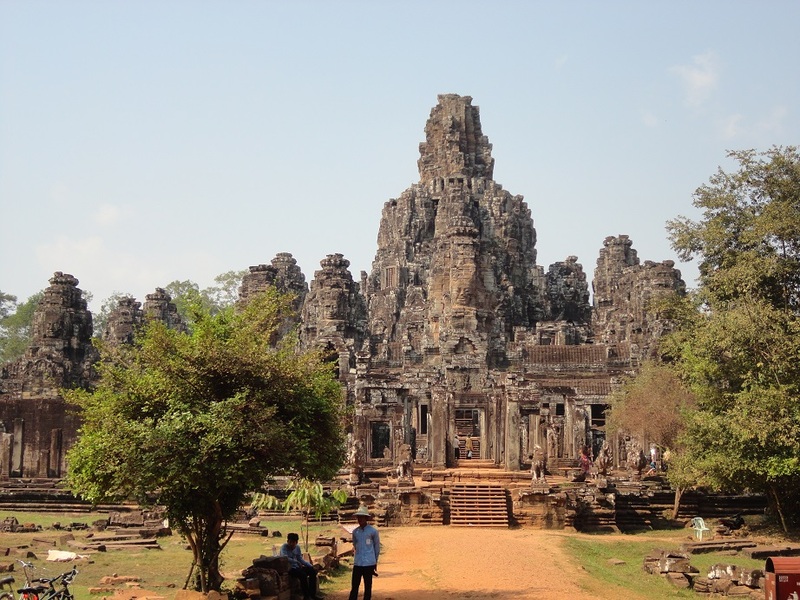 Compared to the immensity of Angkor Wat, the Bayon is quite small. Yet R, our guide, finds the Bayon to be his favorite of the Angkor sites, largely because of the 200-plus smiling faces – of Avalokiteshvara, the great Boddhisattva of infinite compassion, and Jayavarman VII simultaneously – on each of the four faces of the 54 temples, each representing one of the regions of Jayavarman’s kingdom. Those faces smile down on you from every direction. 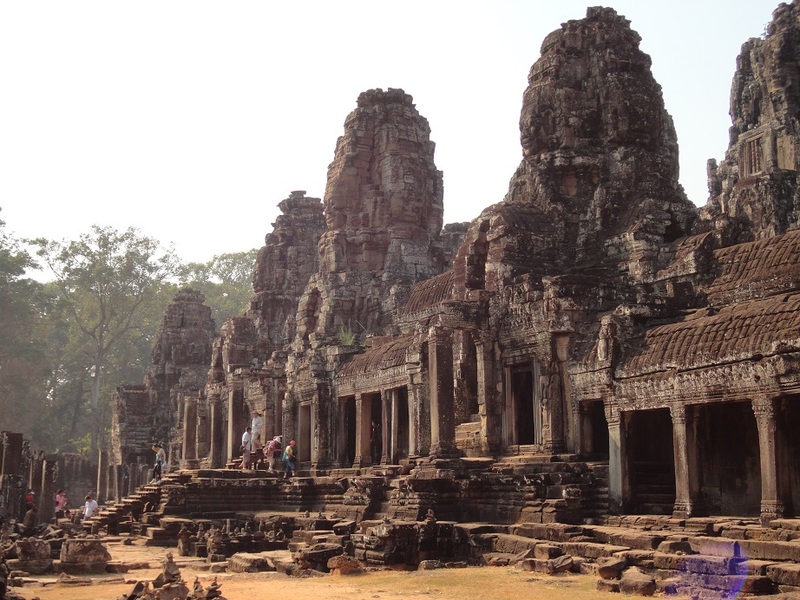 During a break between this afternoon’s temples, I have a chance to get a few thoughts down about Angkor Wat, which was as amazing as I was expecting. As we were approaching, our guide R shared a few facts. 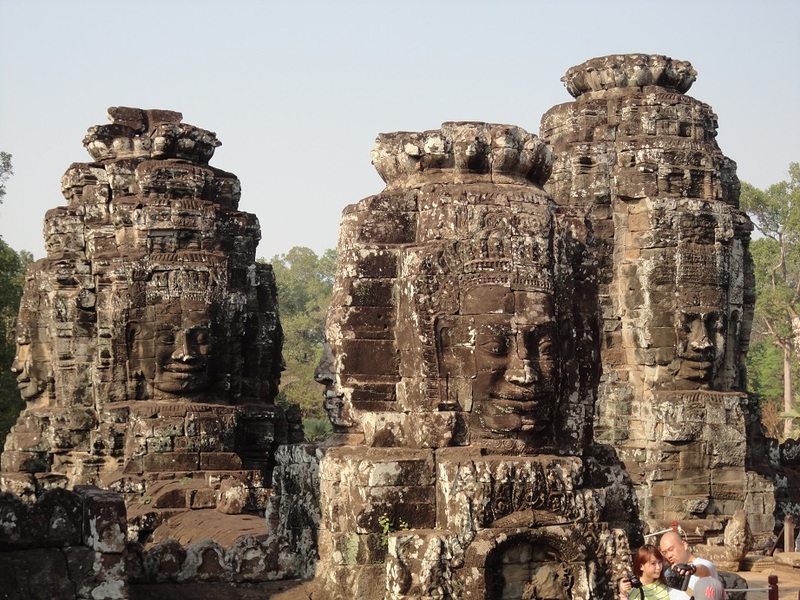 The building process for Angkor Wat took 37 years, and involved an estimated five million tons of stone and 200,000 to 300,000 workers. 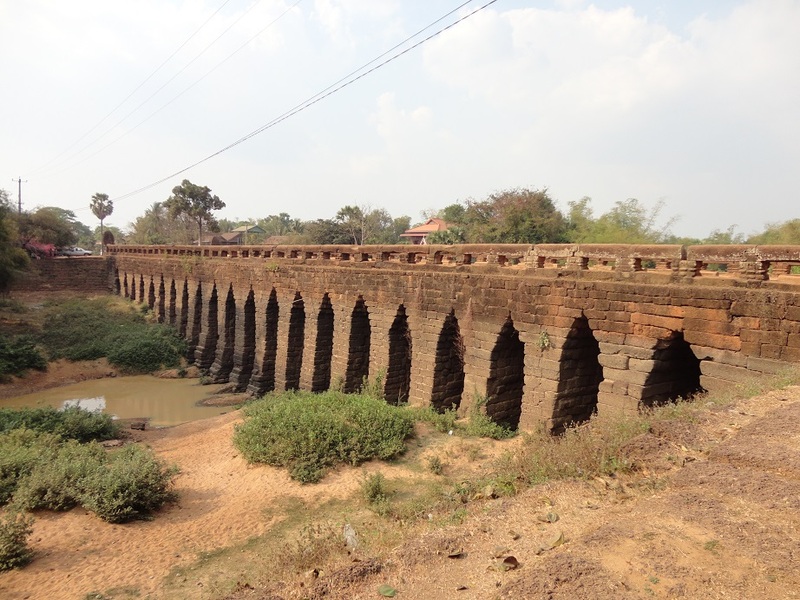 The stone was quarried some ninety kilometers away, and was transported to the site by water, then by elephants. 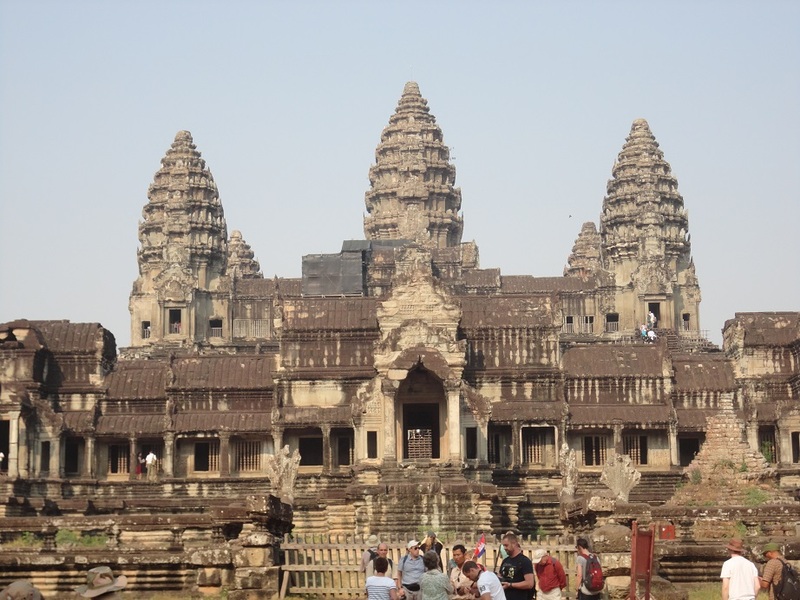 Location was key: Angkor Wat was at the center of the Khmer Empire, as well as adjacent to Tonle Sap Lake – a good source of water for agriculture and fish – and on soil that was good for large-scale building. As the funerary monument for King Suryavarman II, Angkor Wat is the only Khmer temple that faces west, toward the setting sun. 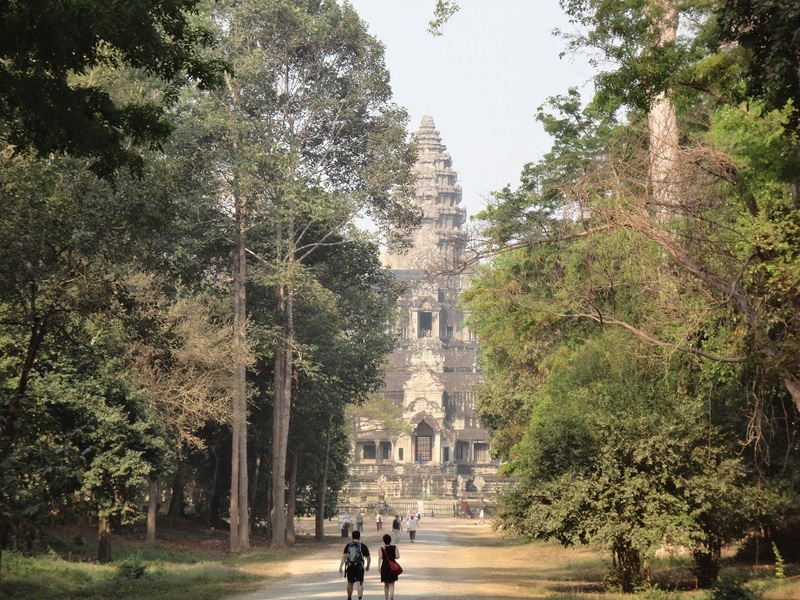 Since it faces west, our guides were smart to have us enter via the far less busy east gate, which afforded both a wonderful view, with good light for photography, and vastly fewer people than we would have seen at the main west gate. Towering above us was the central representation of Mount Meru, the hub of the universe and home of the gods. Yesterday was a long day full of experiences, and I wasn’t quite up to, or didn’t have the time to, recount it all yesterday. So here I am writing this down, first thing in the morning, just a couple of hours from seeing Angkor Wat! We started yesterday with another look at small village life, a feature of this tour that has been extremely welcome. 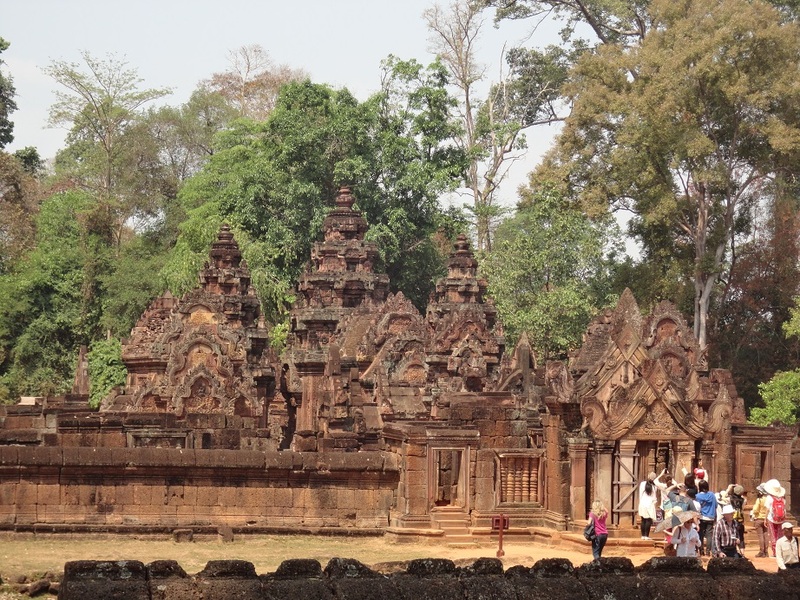 Banteay Srei, our main destination for the morning, is nearly an hour away from Siem Reap, and along the way we stopped at a couple of places. Rice is, of course, a three-times-a-day staple of most diets here. 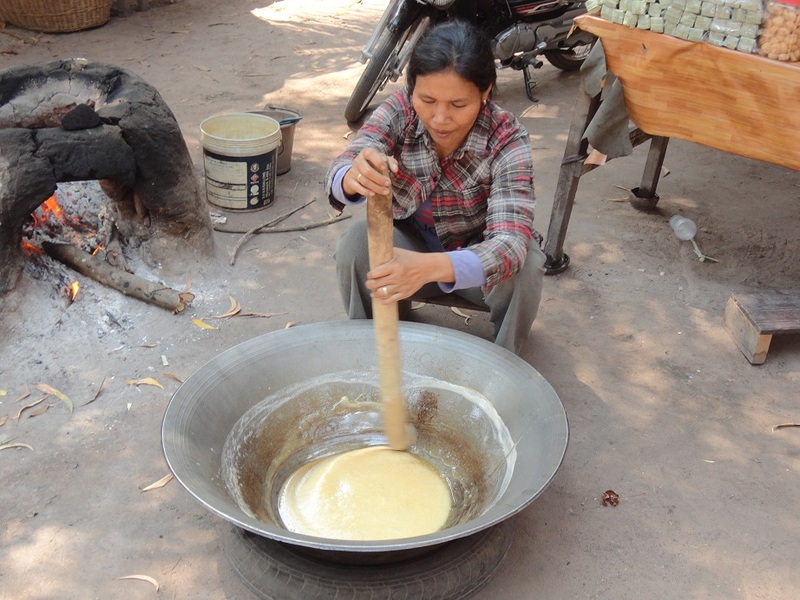 Once upon a time, grinding the rice into flour and making noodles out of it was a treat saved for a single instance a year, on the Cambodian version of Thanksgiving Day. 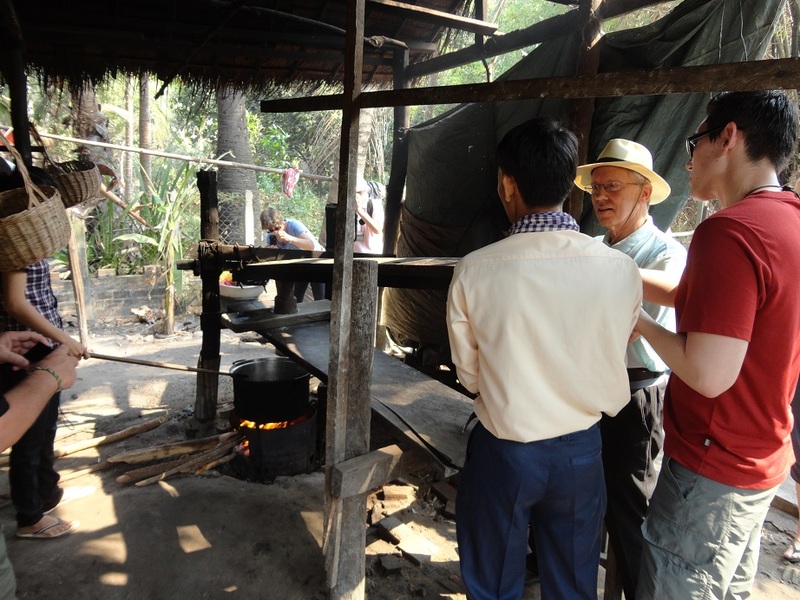 Now it’s much more commonplace, and we saw the traditional process by which the noodles are made. The rice is ground and soaked and pounded into a dough, which is then pressed through a fine sieve into long thin noodles that are immediately cooked. They only stay fresh for one day. I tried some, and they were great. The young woman that prepared them was very attractive, and, apparently still unmarried at the late age of 28. As her mother lamented this fact, I thought, briefly, about offering her marriage and a trip to the U.S., but feared this might not go down so well, culturally or personally! 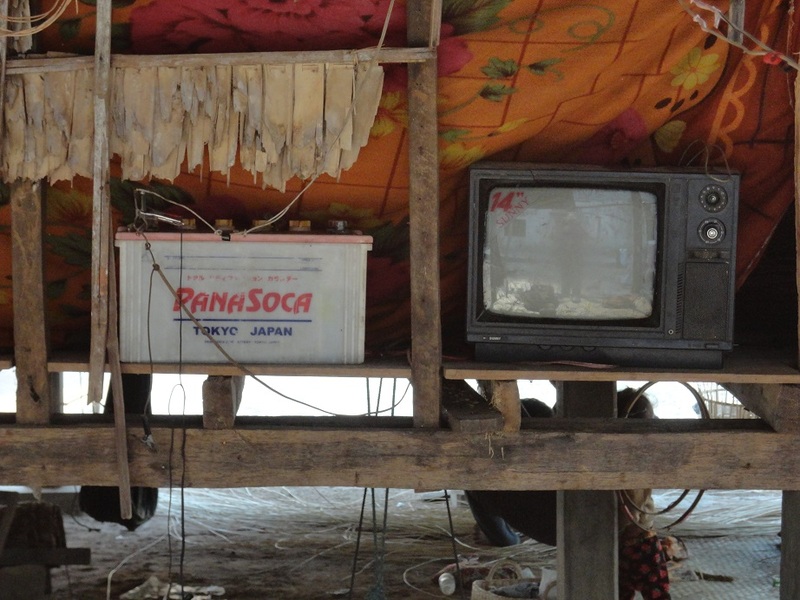 Most Cambodians don’t have access to electricity, and it was common in these villages to see car batteries employed as a source of power for televisions and for charging cell phones (which are ubiquitous here as everywhere else). We also visited some basket makers. 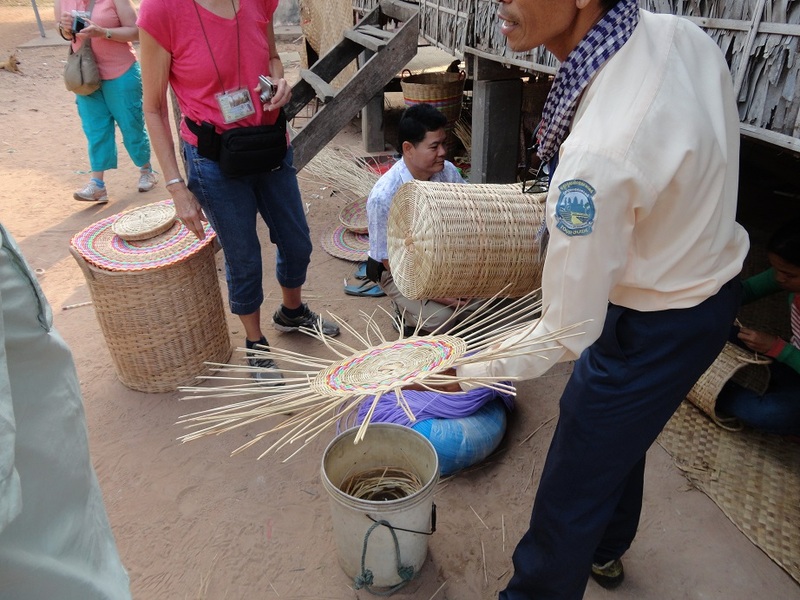 Using long strips of rattan and a little colored plastic, they create beautiful baskets of all sizes to order for middlemen that then sell them. 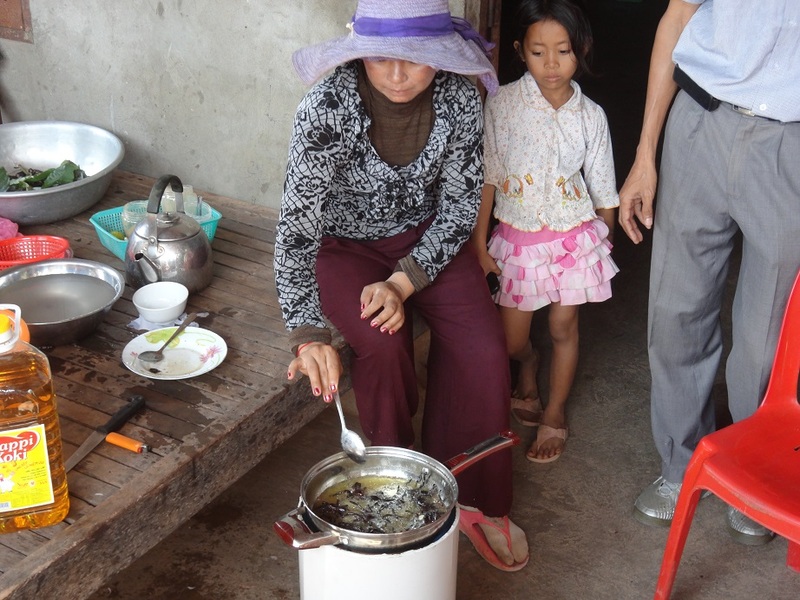 It, like the noodle making, brings in a little extra income for families that largely make their living from farming. 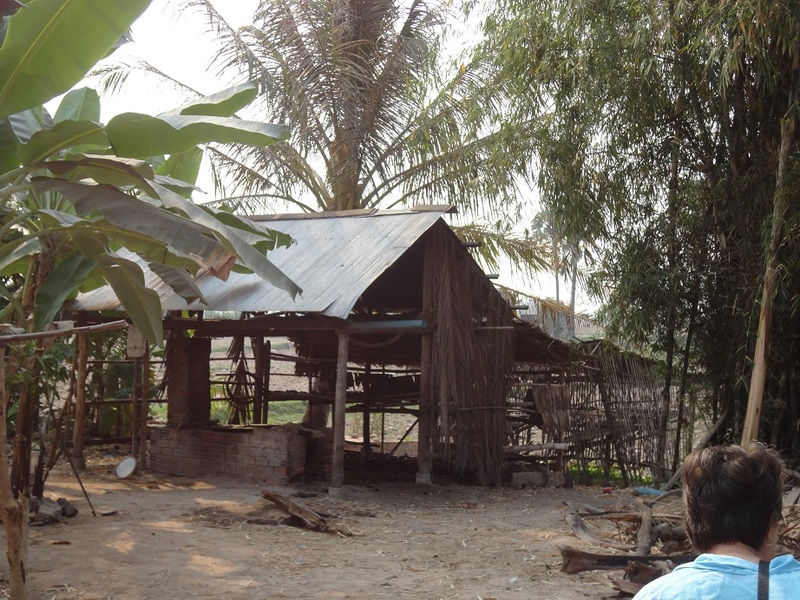 The same goes for the candy makers we met later in the day, who use the fruit of the sugar palm tree, the national tree of Cambodia, to make liquid sugar that is formed into tasty treats. I bought a couple of baskets of these for work and home. 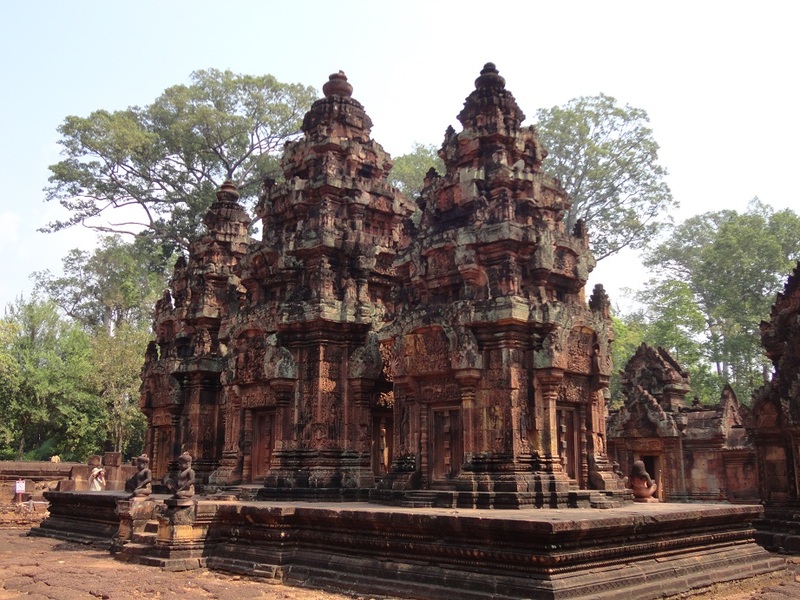 Then it was on to Banteay Srei! As today was largely a driving day, there won’t be a whole lot to report. But I’m sure I’ll make up for it over the next two days in Siem Reap. We said goodbye to our Phnom Penh guide T, and welcomed our guide for Siem Reap, R. He seems very nice, and has strong feelings – positive ones – about the state of Cambodian politics and society. It was nice to hear him point out that his country as well as Vietnam and Laos are tired of warfare and killing, and want to move on to a future of prosperity and self-determination. He also mentioned that the people increasingly reject one-family rule, nepotism, and corruption. None of that sounds so different from where Thailand is right now. I hope we’ll hear more from him on these subjects in the next few days, although I have a feeling we’re going to be in a more historical mode during that time. 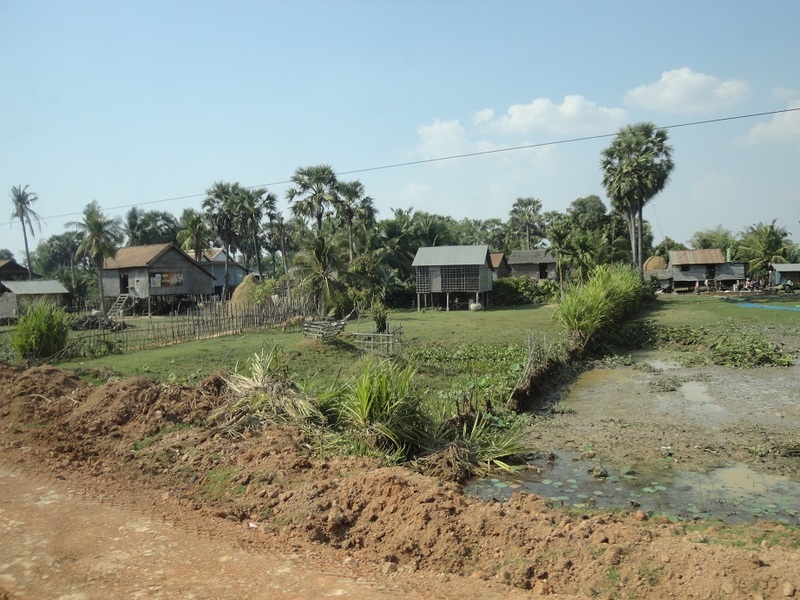 We got to see several hours of the Cambodian countryside during our drive today – not perhaps as lush as we saw in Vietnam, but similar insofar as the land was mostly dedicated to crops and farming, with occasional, fairly small towns and villages. 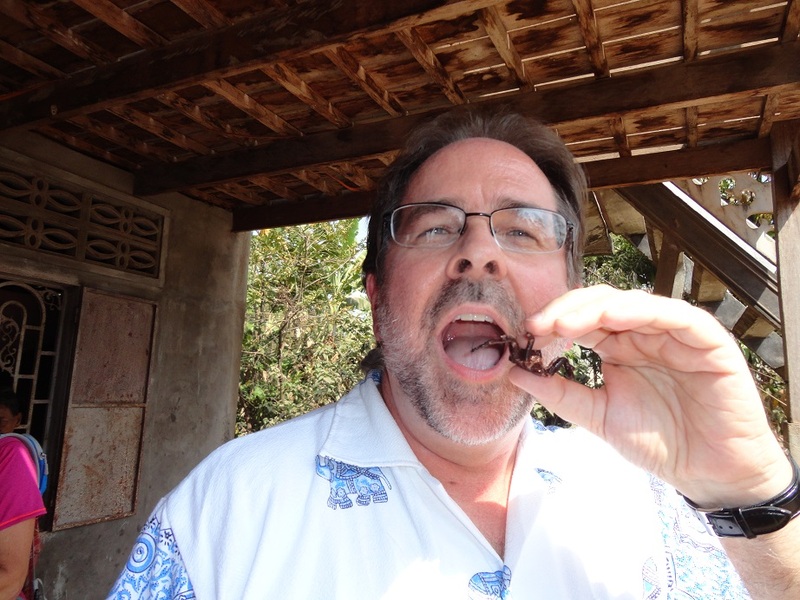 A stop we made that will likely be memorable for everyone involved was at a small village where some of the people are dedicated to capturing, selling, and cooking and eating tarantulas. Our host showed us how she finds them in small holes a few inches underground. She quickly defangs them – with a nail clipper! The tour members didn’t seem especially fearful, and a few had them crawling around on their arms and torsos. Later she showed us how she cooks them, killing them first with a little squeeze to the midsection, then frying them with some garlic in oil for a few minutes. Verdicts on the taste were pretty positive; I contented myself with a photograph. This little excursion was made especially delightful by the dozen or more kids that greeted us and followed us around. They were incredibly cute and unaffectedly friendly. I wish I could be as unreserved with people as they. 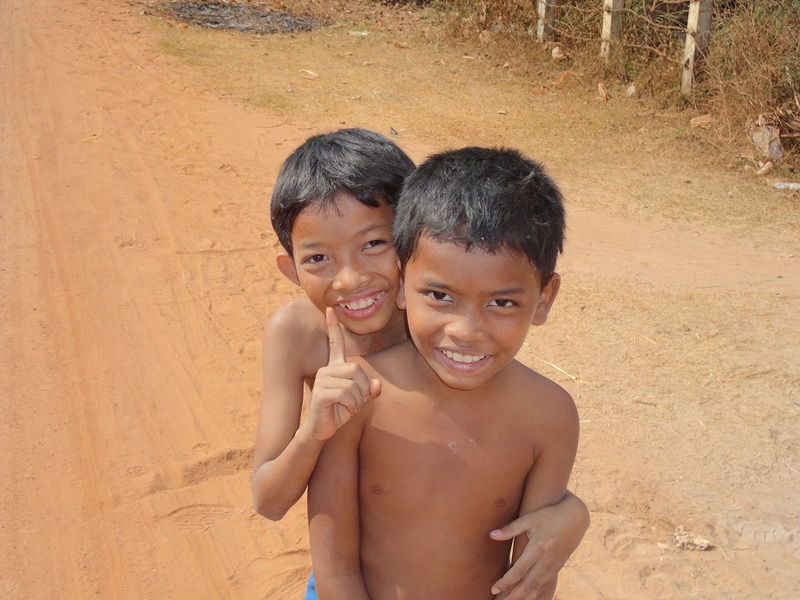 I suppose all young people are great looking, but Cambodian kids, with their big smiles, do stand out. Much fun! 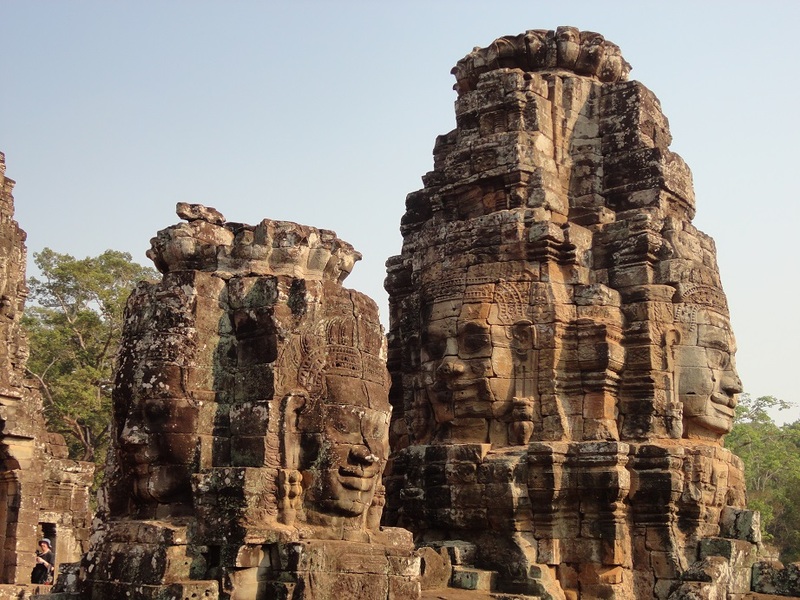 A couple more hours driving, and we arrived in Siem Reap – a city of 1.2 million, I was astonished to hear! They welcome over four million visitors each year. We stopped briefly at the Royal Residence, where I got to hear a few minutes of wonderful music, presumably Cambodian traditional and/or court music, at the nearby Buddhist temple. From there we made our way to the very comfortable Angkor Home Hotel that will be my home for the last few days of the trip.